by carrying out meticulous quality control in a clean and hygienic environment and pursuing the values of honesty, integrity, and trust. V-Korea has established its production facility in 2013 in Gimhae to fully meet growing demands of its quality products. V-Korea has obtained a multitude of certifications such as KGMP (Korea Good Manufacturing Practice) and ISO13485 and has been selected as one of companies that exhibit products at trade exhibitions, led by SMEs Business Center of Gimhae City, proving the company’s technological competitiveness. V-Korea’s melting thread “Lifting” can be melted without surgery and completely realizes face lifting and body lifting. Now it is considered popular anti-aging treatment. By using melting PDO thread, customers can enjoy the effects of skin lifting and skin lightening, without invasive surgical measures. It effectively reduces wrinkles by lifting drooping skins. It adopts surgical suture (absorbable thread) that has a pointed projection, which is inserted to any part that needs a lift (e.g.nose bridge, tip of a nose, nose wing, etc. ), pulled, and firmly fixed in order to improve the shape of a nose. It improves kin elasticity and clarity with the thread, which is melted in the skin within six months and promotes creation of collagen. [INQ. NO. 1606E17] PS plate and, PMMA diffuser plate from Sewon Precision&Ind. have high diffusion and outstanding shielding power. Thus, PS diffuser plate is high-quality light-diffusion plate forming various product families by transmittance as well as for LED TVs, as it has outstanding light diffusivity and light stability. And PMMA diffuser plate has excellent forming machinability, heat-resisting property and weather protection, thereby making it possible to produce various forms of products. LGP is a component included in the backlight unit (BLU) of the liquid crystal display (LCD). LPG is the optical component composed of transparent synthetic resin, such as PMMA, which changes the route of light from the line or point light source comprised of cold cathode fluorescent lamp (CCFL) or light emitting diode (LED) light source to the surface light source. The company’s Hilumi A (high-gloss acrylic sheet like glass) is composed of a clear layer. It does not incur stripping unlike other similar color products painted or laminated with film on the back, and any minute scratch on it can be removed simply with a piece of soft cloth. In addition, when treating the hard coating, it can endure scratches caused by 6H pencil hardness. Since its establishment in 1999, Sewon has endeavored to contribute in the development of Korean industry based on development of new industrial materials. [INQ. NO. 1604E22] Gwangju-based PPI has become one of the leading manufacturers of the optical electronics industry in Korea, successfully utilizing its superb original technology in developing planar light wave circuits to produce the optical power splitter and arrayed waveguide grating (AWG). These two components are key to the construction of FTTH networks, providing high-speed communication that reaches the individual household. These cutting-edge products have careers of being exported to the U.S., Japanese, and Chinese markets and also being delivered to such big local ICT enterprises as KT, SK Broadband and LGT Corporation. PPI’s optical power splitter is designed to be used in FTTH to separately transmit the signals that are sent from the telephone office or the cable stations through a single optical cable to multiple membership locations (apartments and houses), thereby constituting a key component of the optical membership network. PPI’s manufacturing capacity of components ranged from chips to modules reached the global upper-level, enabling the company to actively lead the global technological trend. [INQ. NO. 1604E14] Since 1997, Iris ID has been the key developer and driver of the commercialization of iris recognition technology. IrisAccess, now in its fourth generation, is the world’s leading deployed iris recognition platform. Found on six continents, in thousands of locations, authenticating the identities of millions and millions of persons, more people in more places authenticate with IrisAccess than with all other iris recognition products combined. Iris ID’s IrisAccess® 7000 continues to set the highest standard for performance and versatility for iris recognition. Whether you are looking for a single biometric identification solution that leads the industry, or a multifactor verification solution that works with cards, card readers or keypad solutions, the IrisAccess platform will meet your needs. Iris ID has been the leader and key developer and driver of the commercialization of iris recognition technology for the past 18 years. IrisAccess continues to lead the market as the world’s most advanced and most widely deployed iris recognition platform. The iCAM7000 series is the newest generation in the iCAM series and is completely compatible with the prior iCAM4000 series solution deployed worldwide. IrisAccess, now in its fourth generation, has even more features and functionality with greater integration flexibility. Iris ID’s biometric solutions provide highly accurate, non-contact identification by the iris of the eye from 14 inches away while delivering security, convenience, privacy and productivity to millions of people around the world. The iCAM7000’s versatility and flexibility allows for easy integration with many Wiegand and network-based access control, time and attendance, visitor management and point of sale applications. Engineering and design teams have further enhanced the intuitive user interface of the iCAM series with visual and audible prompts that provide the easiest, quickest and most accurate iris enrollment and identification. A rapid auto-tilt capability further increases both speed and convenience with a simple touch or when combined with cards or PINs to adjust for height. A face image can also be obtained during enrollment to streamline badging and visitor management applications while a space for an optional surveillance camera has also been incorporated. A new iData™ software suite for access control, as well as SDKs and a development tool kit allow partners to build identity management applications which support several encryption alternatives, are FIPS201 compliant and include PKI support. Experts also concede that the countermeasures built into the IrisAccess suite set the standard for the industry. Every iris pattern is unique and stable for life and since there are more readily measurable characteristics in the iris, iris recognition is regarded to be the most accurate, fastest, and scalable option for both small and large scale biometric deployments. Other biometric modalities such as fingerprint, hand, voice, vein and facial characteristics can often vary and change over time or with use conditions. hardware form under the brand name ‘ezTCP’. The ezTCP hardware consists of Serial to Ethernet/WLAN/PPP converters and remote I/O controllers. Its high quality and stability have been proved throughout the world as more than 4,000 companies have chosen Sollae Systems’ products over the past 14 years. With ezTCP, the company has been providing customers with perfectly optimized products to meet their needs and developing TCP/IP stack to demonstrate the best performance with an affordable system. ezTCP is an easy way to connect your devices to the Internet such as LAN, ADSL, etc. to facilitate remote control and monitoring within a short time. To share information through the network, the data should be compliant with international data handling protocol, TCP/IP, and ezTCP implements data communication as a serial to TCP/IP converter. Therefore, connecting ezTCP enables equipment to transmit and receive data over the Internet, which has been used to exchange information with serial communication devices. Most of all, ezTCP overcomes the defects that serial communication devices have, such as distance limitation, high initial installation/maintenance cost and impossibility of being controlled with more than one PC. WLAN converter series of ezTCP are wireless LAN converters for serial devices that help simply add wireless network connectivity to users’ equipment without changing software. By applying them, the user can reduce installation/maintenance cost and risk, but shorten development time to add the network capability in the user’s system. 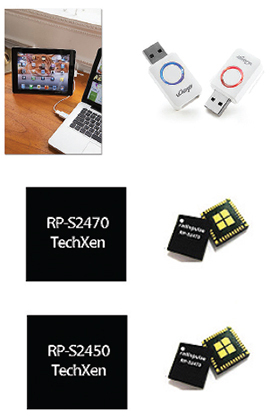 WLAN converter series consists of an external-typed converter, CSW-H80, and module-typed converter, CSW-M83 and CSW-M85, which are easy to apply to users’ devices due to its compact size and strength combined with lightness. Especially CSW-M85, module-typed converter with RalinkRT 3070 WLAN, is embedded with not only a chip antenna but also a socket for an external antenna, so it is easy to be used in various wireless network environments. [INQ. NO. 1604E08] Since 1999, MarkAny has led DRM and Watermarking Technology and has been providing solutions for internal security, media content security and forgery prevention for online e-certificates. MarkAny has in-depth knowledge and technical expertise, and provides the most experienced and highly qualified consultants. MarkAny is highly reputable and possesses important technical references in the proposed security area. It has established around 700 reference sites across every industrial sector, covering the public, financial, manufacturing, communications, and online services in Korea and overseas over the past decade. MarkAny’s Document SAFER™ is designed to protect classified internal data and sensitive documents in organizations. It prevents internal users from distributing internal information to unauthorized users through floppy discs,CDs, flash drive, e-mail, etc. Unlawful distribution of companies’ valuable knowledge and assets, such as blueprints, financial information, product R&Ddata, patents, new business plans, etc. are linked to direct revenue losses. Document SAFER™ was developed to resolve these problems as an optimal solution with MarkAny’s proprietary technology. Document SAFER™ utilizes DRM technology to control access to internal documents using Microsoft Office, Open Office, Adobe PDF, Images and Auto CAD drawing applications. Document SAFER™ enables an organization to grant authorized access rights over internal staff according to their levels of security and job responsibility. Every movement or activity (i.e., reading, saving, editing, printing, uploading, and downloading) can be monitored and traced by an administrator. typically integrates with existing enterprise systems, such as ECM, EDMS, ERP, KMS, BPMS, GW, etc. In those business environments, MarkAny provides the enterprise solution vendors with flexible and standard interfaces. Document SAFER™ can be employed and used by manufacturing corporations, government agencies, law firms, financial institutions, high-tech laboratories, new start-up ventures, and various other industries. Moreover, MarkAny recently released automatic contents recognition (ACR) solution planned to be marketed with the name of “MediaPlus.”This latest solution recognizes and identifies various broadcasting media contents from TV, radio, etc. and then supplies many value-added information to users. A spokesperson said “We now expect ACR technology could facilitate the connection of various information based on broadcasting media and web. So, in the near future, users can perform such social commerce as confirmation of restaurant-related information on air, or download of coupons while watching a TV drama.”And an AD service which is linked to PPL in drama will also probably be soon available. [INQ. NO. 1404E38] Gary Choi, president founder of TechXen Inc in 2011, brings with him more than 27 years of semiconductor industry experience from GCT Semiconductor and the LSI division of Samsung based on elite education and training from the Korea Advanced Institute of Science and Technology and ChungAng University. His vice president has an equally impressive background from Ubicon and Samsung as well as a Ph.D. in electronic engineering from Illinois University. Their markets and applications are in areas like RF4CE remote controller, RF remote controller, wireless sensor network, wireless control, wireless network and others. Its products and solutions are just as superior, with areas like 2.4GHz RF IC integrated system in package chip, 2.4Hz RF antenna and wireless application board and software. Its design services focus on wireless control, monitoring and sensor network applications. Moreover, they are also involved in smart energy and mobile, two outstanding areas for future growth. For its design services, some of its core technologies are sectors like software design, system in package, application software and wireless protocol. For its target applications, it highlights sectors like CE, smart grid and others. [INQ. NO. 1404E33] The Internet changes the world. Behind this revolution is optical communication, backed by optical fiber. Through this, the most suitable medium, transmission of data-carrying light from one place to another is taking place. Thus, your optical communication ultimately depends on the quality of the optical fiber, which is why you should talk to Korea’s FNN Co. Ltd.
As Korea’s spare parts maker for optical communication equipment, F&N offers core items for BcN infrastructure which is considered to be the main information technology (combining communication and broadcasting) in the future. 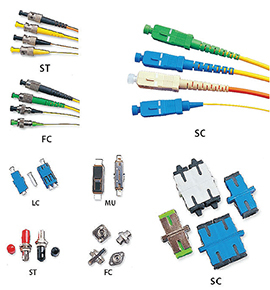 The company sells various items: optical fiber patch cord, optical fiber adapter, silicon fiber array, silicon vgroove, optical fiber ferrule, etc. For optical fiber patch cord, FNN accepts your customized requests. Its standard products strictly comply with JIS, IEC, and Bellcore. Optical fiber adapters are easy to handle and are available in many different types. Also there are ceramic or phosphorous bronze sleeves. [INQ. NO. 1404E29] Today, information travels faster than ever. Of course, in the age of the Internet, it may not impress you much, but how about all the data moving from one end to the other in the blink of an eye? It still amazes many people. Behind the achievement is Korea’s Shinhan Networks. The fiber optical component maker has been around only for one year. Yet, it understands the market in which trends and technology never stay the same. To meet the high demand for top quality products, Shinhan works together with the blue shift (TBS) for its own ZrO2 ferrule which is the core part for any fiber optic item. Based on this ferrule technology, the company can provide upgraded and super quality fiber connectors. Filed Under: NEP Technology Tagged With: durable optical fiber ferrules, Ferrule Technology for High Quality Fiber Optical Components, fiber connectors, patch cords, reliable, Shinhan Networks Co. Ltd.